Steady, ready, go! Here in Sedilo on July 5-7, a fab horse race and festival will take place! If you are in Sardinia you can’t miss this rural and intese festival out! A tip for summer tourists who loves traditional festivals and are in the heart of Sardinia: go and celebrate one of the biggest festivals in Sardinia. It is “L’ardia di San Costantino“, and this fest commemorates Constantine’s victory over Maxentious at the Mulvian Bridge in 312. Here Constantine saw a flaming cross with this written on: “in this sign thou shall conquer”. Every year on July 5th through July 7th, outside Sedilo’s eastern boundary, a enormous horse race is held on the grounds of the Santuario di San Costantino. On the evening of the race event, everybody gathers on a hill outside the sanctuary. After a call for defending christianity and prayers, he horses started their run and the riders represents Constantine charge, his two flag bearers, and the thundering herd close behind. When the riders reach the Sanctuary, they will stop in a circle, getting blessed by the priest each time they pass the front gate. They need to do seven times, but Constantine, who takes off after the sixth pass! All then runs to the dry fountain and this is the end of the race. Only one person each year is allowed to play Constantine’s character for the race: he has received a special “dispensation” from God. An open field hosts the festival while tasty pigs rotate in wood fired ovens ! The next morning the race is run for the locals. After the race everyone goes down to the priest’s house to drink vernaccia (the local wine) and pastry. 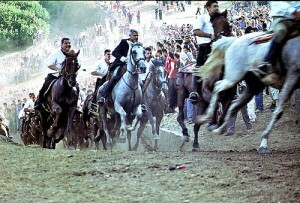 So are you ready to merge into the rural Sardinia and discover one of the most ancient horse race in Italy? If so, pack everything and fly over! This entry was posted on Thursday, June 21st, 2012 at 5:40 pm	and is filed under Events in Italy. You can follow any responses to this entry through the RSS 2.0 feed. You can leave a response, or trackback from your own site.